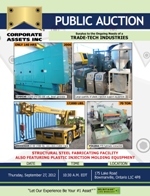 Corporate Assets Inc. | Trade-Tech Industries - Corporate Assets Inc. STRUCTURAL STEEL FABRICATING FACILITY FEATURING: PIRANHA P70 ironworker, CUMMINS (2006) 600 volt, 120 AMPS, diesel generator, HYD MECH (1999) S20 band saw, MOTOMAN (2000) 6 axis robotic welding cell with positioner and enclosure, LIAN FENG horizontal band saw, VOEST 20"x27" engine lathe, ENTERPRISE 15"x21" engine lathe, CHEVALIER FSG 618M grinder, MAXIMART M606 60A EDM, ACADIAN radial arm drill, THERMAL DYNAMICS & HYPERTHERM plasma cutters, PLASTICS department to include BATTENFELD injection molder, lrg. qty of air dryers and hoppers and temperature controllers, (15) CANOX, HOBART, LINCOLN, LINDE, THERMAL ARC, MILLER welders, ARTOS (1997) wire cutting and stripping machine with feeder, (4) KENCO wire crimpers , KONECRANES 5 ton bridge crane with 35' span, BRODERSON 17,000 lbs. mobile crane, CLARK 12,000 lbs. LPG forklift, CATERPILLAR 6,000 lbs. LPG forklift, TOYOTA 3,000 lbs. electric forklift, JLG scissor lift, SHAW BOX & JET electric hoists, also: rotary screw and piston air compressor, inspection and testing equip, ultrasonic welders, saws, milling machines, large inventory of steel including sheet, plate mesh, angles, and tubes, hydraulic power packs, rolling shop ladders, lifting accessories, tool cabinets, steel work benches, portable air compressors, portable generator, cement mixer, saws, job boxes, shop fans, drill presses, grinders, huge assortment of electrical and gas powered tools & equipment, and more. Motorcycle and Trailers: SUZUKI (2004) S40 BOULEVARD custom cruiser motorcycle, RIO (2006) 12' dual axle utility trailer, CANADA TRAILERS 14' dual axel utility, FRUEHAUF 45' tri- axle flat bed trailer, TRAILERENT 48' box trailer, FRUEHAUF (1987) 45' box trailer, MOND (1986) 25' box trailer, custom dual axle utility trailer.